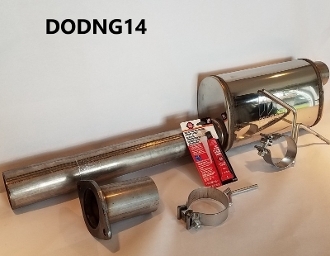 This is a do it yourself Muffler retrofit kit for the 2019+ Dodge 1500 5.7 Hemi truck. Why change the complete cat-back when the factory dual tailpipe system is already made of a 409 grade of stainless steel? We offer four sound levels, they are Very Aggressive, Aggressive, Moderate & Mellow. Please indicate which muffler desired when ordering. Also, please be certain of what you want as far as sound before making a muffler choice. This muffler retrofit is something that can be done by the casual mechanic & requires No welding at all, but does require some cutting. There is no need to pay a "Muffler Shop" to do a job like this with a universal muffler and substandard aluminized tubing when you can get a complete Mufflex 409 SS tube kit that has been engineered to fit your truck without issues. And there is no need to purchase a complete "cat back" when it is not necessary and not be able to have a muffler choice in what sound you want from your truck. This system fits all 2019+ to Present Dodge 1500 half ton pickups with the 5.7 Hemi engine 2wd 4wd all wheelbases. This unit was designed for the newer Ram Trucks from 2019+ to present. Much time has been spent designing this kit, so the factory alignment of the tailpipes will remain the same as the factory settings. All of the parts are made of 409 stainless steel and includes all mounting hardware and instructions for an easy Bolton install. (There is No Welding Required, But there is some cutting...) The customer can usually Before ordering, Please note the sound level chart below. Please make sure of the sound level you desire as Mufflex Performance Exhaust will not exchange your muffler because you do not like the sound level.